While Kara hosted a wonderful Winter Wonderland gathering last weekend, I had a blast whipping up some holiday bites to accompany her festively-hued cocktails. Keeping in mind the party’s focus on chatting, nibbling, and sipping by the tree, I selected ingredients for finger-friendly hors d'oeuvres. As Kara and I first discovered last spring when we arranged burrata over a pool of minty pea pesto, this cheese is above the rest. While the rich and creamy interior is stellar on its own, it is amplified when accompanied by crusty bread and sweet and savory seasonal flavors. 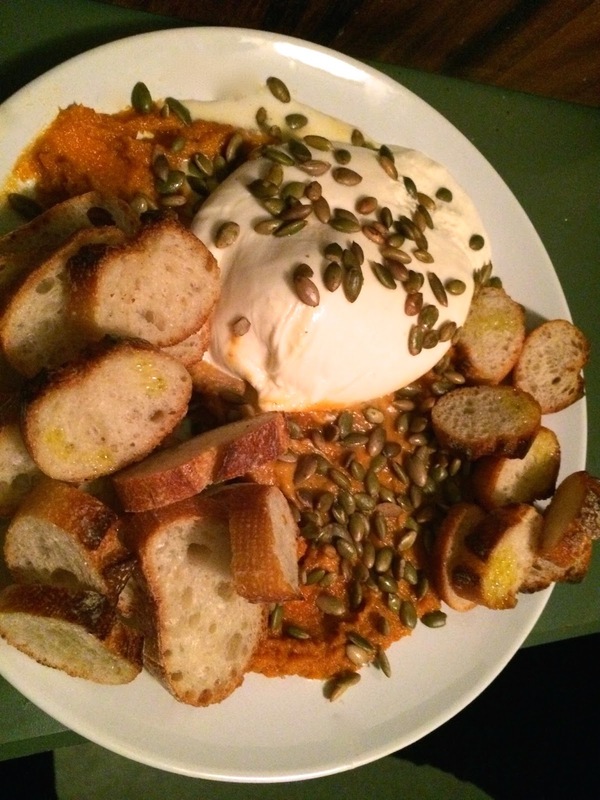 Since I’m still on a pumpkin kick, I whipped up a pumpkin puree with touches of maple and cinnamon, spooned a pool onto a platter, placed the burrata beauty on top, and scattered some, salty, nutty pepitas all over. Our friends slathered the melding ingredients atop crispy toasts and eventually found no need for a knife, dipping the bread right into the swirled medley of flavors. Arrange the baguette slices on a baking sheet and brush both sides with EVOO. Toast in the oven about 3-5 minutes per side until golden brown and crispy. Meanwhile in a small saucepan, melt the butter over medium-low heat. Once melted, add the pumpkin puree, maple syrup, cinnamon, lemon juice, salt and pepper. Stir until combined. Allow the puree to cool slightly and then pour in a thick, even layer on a serving platter. Place the burrata ball on top of the pumpkin puree and sprinkle with pepita seeds. Arrange the toasts around the fancy cheese display and enjoy with a knife for spreading. Serves 6-8.